TI Sparkle Greece S.A., formerly known as Mediterranean Nautilus Greece S.A., is part of Sparkle Group, a leading global telecommunication provider of IP, Data, Cloud, Data Center, Mobile and Voice solutions through a state-of-the-art- backbone of around 530.000 kilometers worldwide. 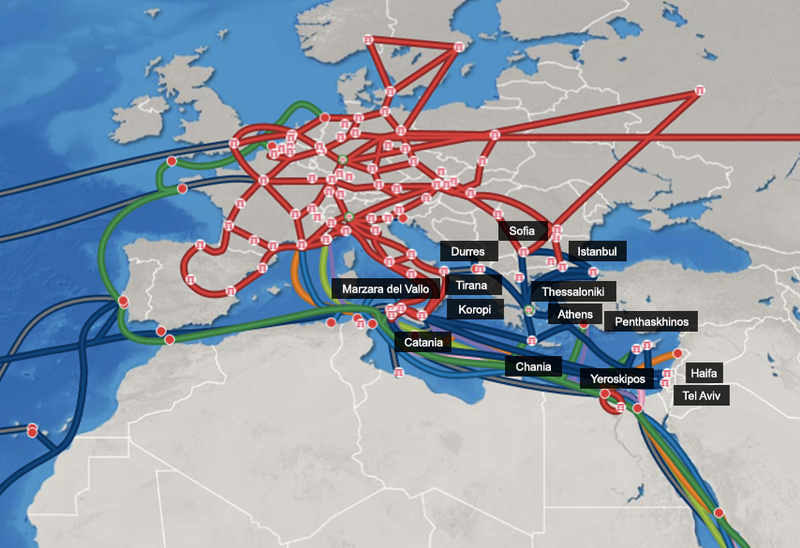 Sparkle’s Mediterranean submarine network spans over a distance of approximately 10,800 km. linking Italy, Greece, Cyprus, Turkey and Israel. Throughout these countries and specifically in the cities of Catania, Athens (Metamorphosis and Koropi), Chania, and Istanbul, our company has privately owned Data Centers. Sparkle Greece manages and operates the whole infrastructure within Greece, that is the backbone as well as the three Data Centers of Metamorphosis and Koropi in Athens and Chania in Crete. Sparkle Ethernet Suite allows customers to connect different international data environments located worldwide through cost-effective, high-performing and transparent connectivity. Our network is our customer’s network. Thanks to the flexible and innovative implementation of IP-MPLS standards, operators can use the Sparkle network to offer their corporate clients a truly international IP VPN service. Operators can extend their coverage across the globe or to specific destinations, maintaining complete control of their customers and homogenizing service features across the interconnection. Carrier MPLS is a flexible and cost-effective solution for seamless global IP MPLS service. A worldwide integrated offer of Voice, Video & IP/Data services, based on a state-of-the-art IP-MPLS multi-service backbone with differentiated Classes of Services, that provides customers with a highly scalable, differentiated IP service with a simplified configuration and management. A managed bandwidth solution providing transparent circuits with top-class SLAs including specific routing, end-to-end circuit diversity with no single point of failure, in order to guarantee customer business continuity. Full Outsourcing offers a global network outsourcing service strongly based on caring & assurance, with a unique interface for the provisioning, installation and maintenance of networks and devices worldwide. The Sparkle Greece network is identified as Aegean Network and comprises a portion of Sparkle’s Mediterranean Submarine Network. Specifically, the Aegean network has three landing points - Aghia Marina, Vravrona and Chania - and two landing stations in Koropi and Chania, Crete. In a ring configuration, the backbone is fully protected and with a guaranteed availability of 99,99%. In the area of Attica, the Koropi landing station is interconnected with the Metamorphosis Data Center through a double routing fiber-optic connection. Our Metamorphosis, Koropi and Chania Data Centers comprise the perfectly monitored facilities where our clients can co-locate their IT and telecommunications equipment. Sparkle is a leading global telecommunication service provider, offering a complete range of IP, Data, Cloud, Data Center, Mobile and Voice solutions designed to meet the ever changing needs of Fixed and Mobile Operators, Internet Services Providers, OTTs, Media & Content Players, Application Service Providers and Corporate Customers. Sparkle’s mission and goals include Excellence in Quality of Services, Customer satisfaction, the protection of information and, environment, all coherently with the principles of sustainability and social responsibility of the Company. Compliance with the applicable legislation regarding, environmental regulations and the ethical code principles of TIM Group, adoption of national and international best practices. Staff involvement and awareness through training and information for active and responsible participation in the implementation of the principles of the Policy and the achievement of objectives. Customer orientation, to understand their current and future needs, to meet their requirements in conjunction with the binding ones, and to exceed their expectations. Optimization of business processes and the “risk-based thinking” approach in order to achieve the expected results with the highest level of efficiency while taking into account risks and opportunities. Rational and sustainable use of natural resources, the limitation of emissions to air, the pollution prevention and the protection of ecosystems and biodiversity, through environmental protection in respect of employees and partners. Continuous improvement of the Management System, with the involvement of Top Management through the monitoring of specific indicators, the review of the objectives and the verification of the effectiveness of improvement actions. Sparkle is committed to communicate, and understand its Policy to all stakeholders (Customers, Suppliers, Shareholders, Employees) and to review it periodically to ensure its relevance to the organization aims.